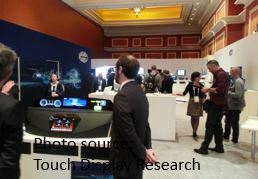 Displays Archives - Touch Display Research, Inc.
Retail markets are in a volatile stage currently. On one hand, many retailers are closing their under-performing physical stores every month. On the other hand, on-line retailers, such as Amazon, are opening more physical stores. Displays, touch screens, camera-based face recognition are playing more and more important roles to help retailers increase revenue and reduce cost, and they help customers to have a better shopping experience. 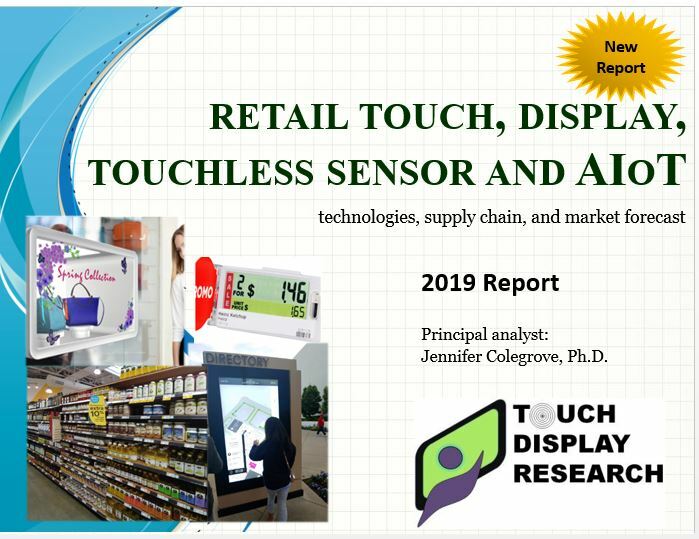 In the newly published “Retail Touch, Display, Touchless Sensor and AIoT 2019 Report,” Touch Display Research analyzed the touch screen technologies, display technologies, touchless sensor technologies, and artificial intelligence and internet of things (AIoT) for physical retail market. This report profiles over 500 companies working on retail digitalization. 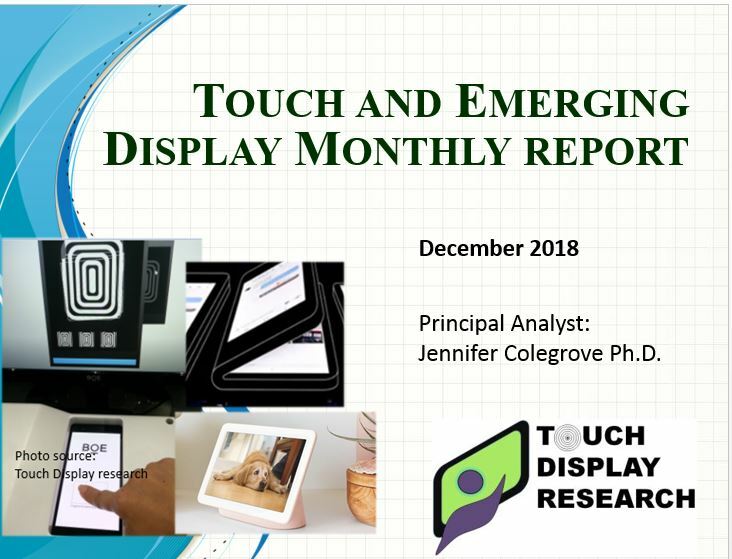 This entry was posted in Displays, Retail, Touch screens and tagged retail AIoT, retail digitalization, retail display, retail display market report, retail market, retail sensor, retail touch, retail touch screen report on March 6, 2019 by jennycolegrove. I’m at CES 2019 in Las Vegas. The weather is nice this year (not like last year’s rain at CES), cloudy and cool. 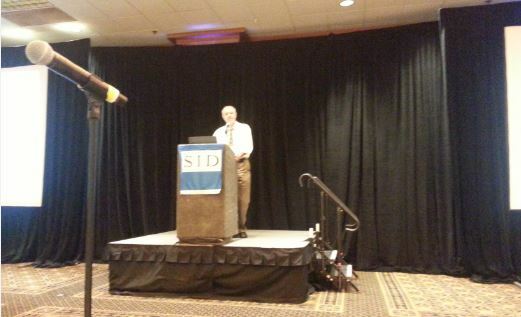 As an industry analyst, the Monday’s press conference is a MUST for me to attend every year. 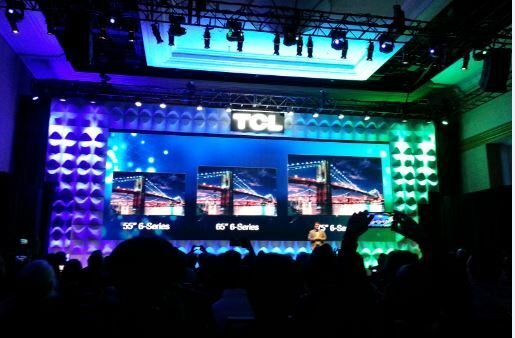 This Monday I attended the press conference of TCL, Toyota, Samsung, Intel, and Taiwan Excellence. I also attended the Showstopper Launchit event. On Tuesday and Wednesday, I visited and talked to many companies at CES. This year’s CES continued several trends from last year, and brought them up to a new level. The CES 2019 key trends include: OLED, Quantum Dot, Micro LED, Sensors Plus AI (Artificial Intelligence), etc. 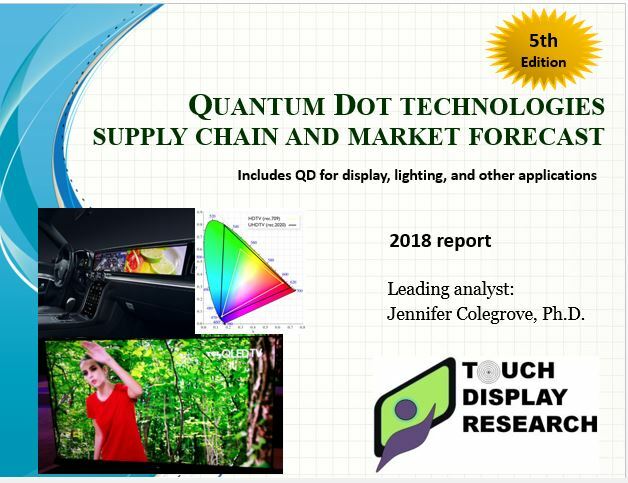 In the Quantum Dot Market 2018 report, 5th edition, Touch Display Research forecasts the global quantum dot market will reach $16.6 billion by 2028. What is the new quantum dot progress at CES 2019? In the Micro LED 2018 to 2028 Report, all the methods to fabricate micro and mini LED displays along with their supply chains are analyzed and put into 15 method categories. Which new companies are showing micro LED at CES 2019? All these will be covered in the upcoming Touch and Emerging Display monthly report, CES 2019 special report next week. This entry was posted in Displays and tagged AI, CES 2019, market forecast, micro LED, OLED, quantum dot, sensors, technology trends on January 9, 2019 by jennycolegrove. November 29, 2018, by Jennifer Colegrove Ph.D. Principal Analyst, Touch Display Research Inc. Recently, Samsung is selling several QLED TVs at sub-$1000 price: The 55” 4K, Q6FN series QLED TV has decreased from $1499 several months ago to $999 now. The 49” 4K, Q6FN series QLED TV has decreased from $1097 several months ago to $698. Touch Display Research believes this low price will dramatically increase its shipping volume. 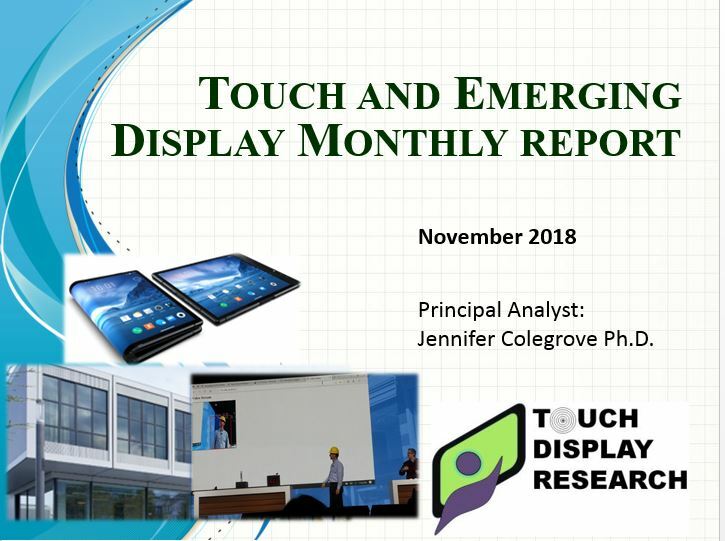 In the recently published “Quantum Dot Technologies and Market Forecast 2018 Report (5th Edition),” Touch Display Research surveyed many quantum dot suppliers, display manufacturers and OEMs, and analyzed and forecasted the quantum dot display component market with details of material type and form factor. This report profiles over 110 companies working on quantum dot materials and quantum dot components. Touch Display Research forecasts the global quantum dot market will reach $16.6 billion by 2028. “The quantum dot industry recently changed dramatically. 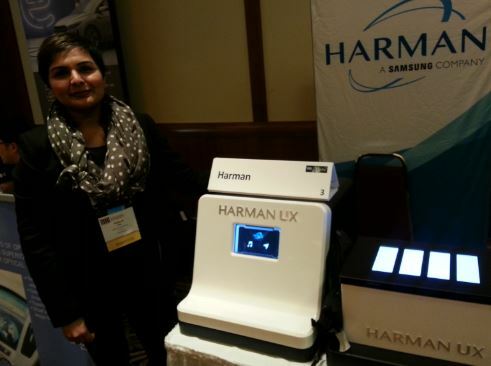 Samsung/Harman is expanding QLED to automotive application, and Apple just entered quantum dot market. 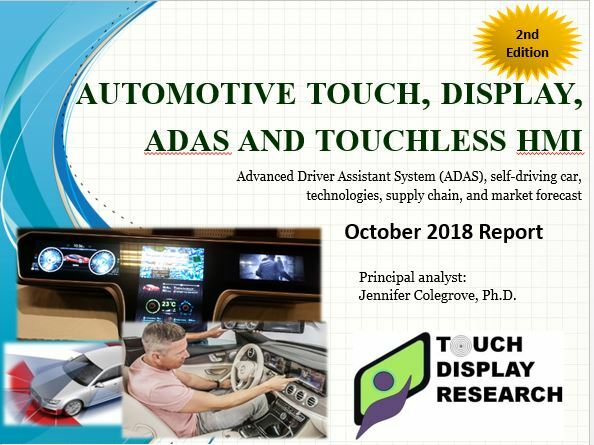 We forecast the quantum dot industry will experience rapid growth in the next several years,” said Dr. Jennifer Colegrove, author of the report and principal analyst of Touch Display Research Inc.
Quantum dot concentrate and pure quantum dot weight (kg) are calculated and forecasted in this 2018 report. Colegrove, author of this report, has conducted many first-hand interviews of quantum dot material and component suppliers, display manufactures, and OEMs in the past 10 years. She is the first analyst to publish a comprehensive quantum dot market report since 2013. What does the new quantum dot ecosystem look like in 2018 and 2019? Which form factor QD will be dominant in 2028? Aside from display, in what other market will QD flourish in the next several years? This report includes a PowerPoint file (500+ pages) and an Excel database. Market data in the report includes five years of historical data (2013-2017) and eleven years of forecast data (from 2018 to 2028). This entry was posted in 4K, Displays, Quantum dot, Quantum dot market forecast and tagged QLED, quantum dot, quantum dot 2018 report, quantum dot display, Quantum dot market forecast, Samsung on November 29, 2018 by jennycolegrove. November 28, 2018, by Jennifer Colegrove Ph.D. 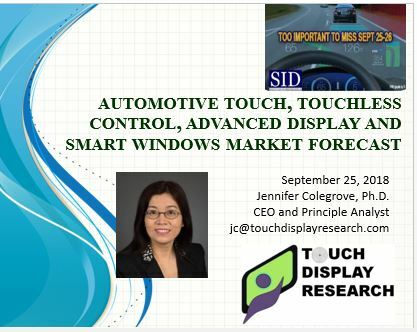 Principal Analyst, Touch Display Research Inc. Recently, Samsung announced displays with a punch hole on the left top corner called “Infinity O”. Touch Display Research believes display with a hole is good idea. It can maximize the display area on the front surface of a device, and allow certain functions to pass through, such as cameras, needles. 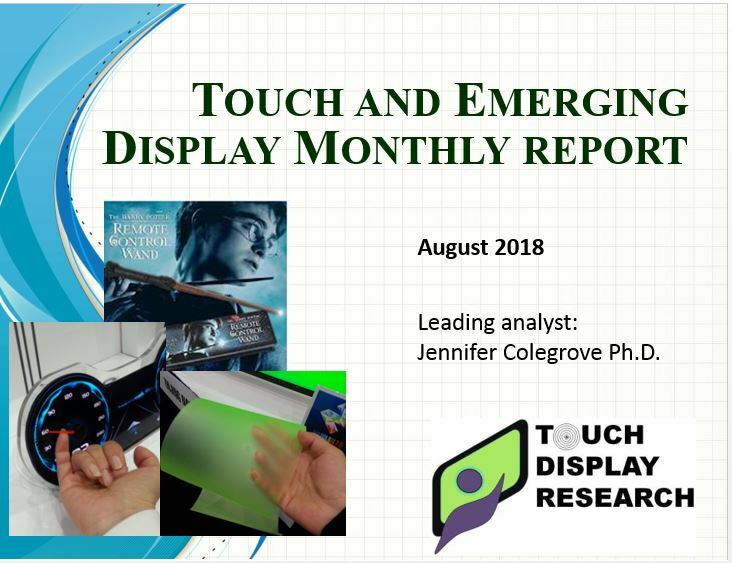 In the Touch and Emerging Display monthly report, August 2018 report, we analyzed many devices and prototype with display with a hole on it. The August 2018 report is available immediately. This entry was posted in Displays and tagged display with hole, display with holes, holes, Infinity O, Samsung on November 28, 2018 by jennycolegrove.